However, there is mounting concern among the UK’s top 50 leasing companies that the opportunities connected cars offer could be thwarted, if issues around data ownership and protection are not overcome. The problem, according to Lex Autolease, is that the operating model for connected cars does not recognise the tripartite relationship that exists in the leasing sector. “The full costs of provision of such services are yet to be understood or recognised,” it said. Despite the well-defined ownership model under operating lease, LeasePlan told the FN50 survey: “Manufacturers are resistant to providing the data to the vehicle owners, seeing the driver as their customer and marketing target, whereas we see them as our customers and should be entitled to control messaging and marketing accordingly. The advantages for end-user fleets could be enormous. “Connectivity can provide greater visibility, assists route planning and help to measure and improve driver behaviour. It is also likely to reduce fuel costs and help reduce accidents, thus improving insurance-related expenditure and vehicle downtime,” explained Inchcape Fleet Solutions. But the data generated by connected cars will also be a potential goldmine, in areas such as traffic flow, identification and reduction of accident blackspots, predictive vehicle maintenance, over-the-air software add-ons, usage-based insurance, subscriptions services, and new services to improve safety, aid mobility and improve travel convenience. The global connected car market was worth $32.1 billion (£24.4bn) in 2016 and is estimated to reach $96.4bn (£73.4bn) within five years. Analysts at McKinsey suggest that by 2030 that figure will have broken through the £1 trillion barrier. Earlier this year, Volvo announced a partnership with Google to develop the next generation of its in-car infotainment system based on the Android platform. It will launch the system on new models within two years, offering a wide array of apps and services. A catalogue of Android apps – developed by Google, Volvo or third-party app developers – will offer connected and predictive services in and around the car. More recently, IBM announced that it was partnering with BMW to provide cloud-based data management for the manufacturer’s connected cars. Information will be collected from cars that have been registered using the BMW ConnectedDrive app. IBM hopes to sign up further carmakers in the coming months and stake a claim in the burgeoning market for connecting passenger cars with customised services based on real-time vehicle performance. Last year, it announced a similar deal with General Motors. Connected car registrations are also growing rapidly. Technology research firm Gartner predicts that, while more than 12 million connected cars were registered globally last year, 61 million will be registered in 2020, bringing the total number of connected cars on the road, either through a built-in communications module or by a tether to a mobile device, to 250 million. Drivers, for example, will be able to download functionality that physically changes a model’s characteristics and specification with a potential huge impact in numerous areas of fleet operations as well as the likely requirement of tax and legislation revisions. 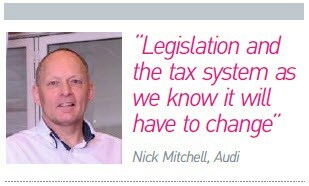 Speaking at an ACFO event earlier this year, Nick Mitchell, service and technical manager at Audi, predicted a huge increase in the delivery of on-demand services to drivers and also the ability for vehicle users to update their cars as manufacturers introduced new functionality. For example, he highlighted how a company car could be sold as a 150PS model, but, on demand, a driver could add a further 20PS, which would completely change a model’s performance and its carbon dioxide (CO2) emission figure and therefore an employee’s benefit-in-kind (BIK) tax bill. The leasing industry will also have to adhere to new data protection rules – the General Data Protection Regulation (GDPR) – which come into effect on May 25, 2018. GDPR builds on existing data protection legislation with a particular focus on digitalisation and technology. Core to the 1998 Data Protection Act are eight data protection principles and GDPR reforms those and introduces new principles of transparency and accountability. The ability to prove consent is a significant pillar of the new regulations. Leasing companies represented in the FN50 also raised concerns over the risk connected vehicles face from hackers. New Government guidance, published in August, aims to ensure engineers developing connected cars and vans will toughen up cyber security and help design out hacking. However, while there are concerns, the overriding conclusion from FN50 companies was that connected cars will take away fleet operation uncertainty. ALD Automotive told the FN50 survey the increase in the amount of data flowing in from connected vehicles, and the infrastructure around them, will “empower businesses to make more informed and timely decisions, enabling them to control their costs, manage their risk, improve their carbon footprint, keep costs down and manage their fleet more efficiently”. “Whether that’s information relating to vehicle health that can help fleets take early steps to prevent breakdowns or more accurate information relating to driver behaviour so that preventative action such as training can be administered, fleets will have more data at their disposal to use and interpret as they see fit,” it said. The traditional model of a leasing company that provides management may no longer suffice. Instead, the industry could be defined by data companies that provide vehicles.